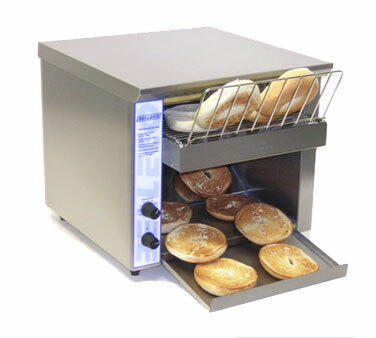 At 400 bagel halves per hour, this 120 volt toaster with its forced air convection heat will produce a toasted bagel in about 15 seconds. This toaster has a little less production than the JT1-B. But the extra wide 2-1/2 inch opening also makes it ideal for buns or larger bagels. Variable speed control, power saver switch, high temperature limit switch. Stainless steel construction, cool touch exterior. 1 inch adjustable legs. 120 volt plugs in anywhere. Made in the USA.